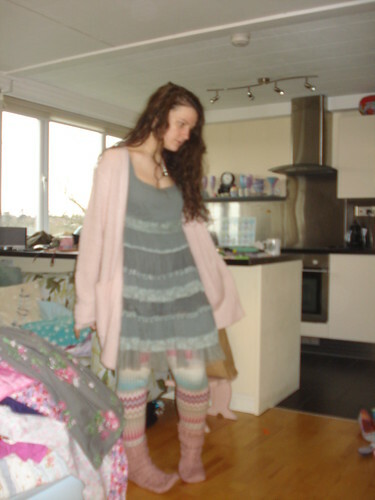 t*rexes and tiaras: but that's just me, before we met..
cosy knitted layers - what more does a relaxed weekend need in weather like we've been getting recently ? 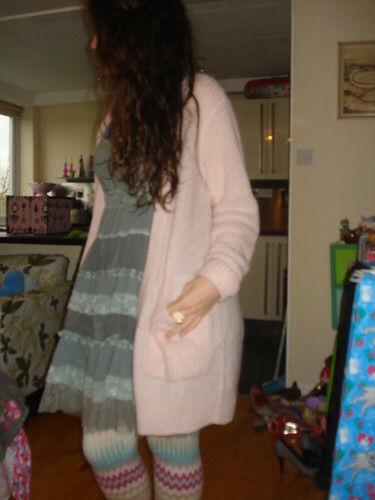 i wore this outfit last weekend to meet up with my favourite girls for lunch, and a late exchange of xmas presents on new year's eve..
this dress is an old favourite, and has had a lot of wear recently, and i figured it would go with the wooly h&m leggings i got for ﻿christmas from my mum., along with this pink cardigan (also h&m) which is so lovely and thick with a bit of a mohair-y feel to it..
i picked this pair of topshop socks (i think they're meant to be slipper-socks as they have the rubber dots underneath) up in the sale about a year ago, and they went nicely into my boots and kept me toasty-warm all day..i love layers! p.s - one of my resolutions this year is to download more music - it's been embarrassingly long since i last updated my ipod with anything new, so i'm always looking for suggestions if you have any..
Ooooh I love all the pastel colours Char! Those tights look so cool!